Geomiso is creating a new era in the field of computational mechanics and industrial design. ​The colors of Geomiso corporate identity are red, black and white. Red circles symbolize the secret of Geomiso success with the color red reflecting team’s passion for research. Black indicates not only the mysterious Computer-Aided Design (CAD) industry, but also the Greek economic crisis, through which the Geomiso project was "born", while the color white signals both the Computer-Aided Engineering (CAE) industry and the accomplishment of the team’s goals. ... and Geomiso was born! It was Thursday, 15 July 2010, when Panagiotis Karakitsios, during a meeting with his mentor Professor Manolis Papadrakakis (School of Civil Engineering, National Technical University of Athens), realized the existing gap between the global CAD and CAE markets and the need for a software with dual design and engineering analysis nature. After 6 years of high added value applied research, Geomiso was created. Based on the new isogeometric method, it solved a major industrial problem (remained unsolved since 1960) bridging the gap between these two global markets, disrupting them and creating high added value for both the engineers and the engineering applications. The isogeometric method is the powerful generalization of the classical finite element method (FEM). FEM was introduced by the famous Greek engineer John Argyris in 1960s, who also began his career at the School of Civil Engineering of the National Technical University of Athens and was the mentor of Manolis Papadrakakis. 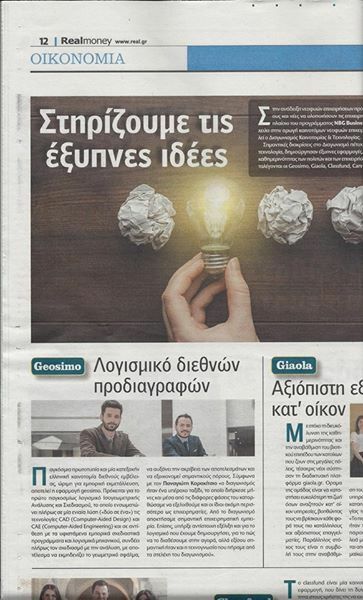 Geomiso won the first award (among 194 projects) in the First Panhellenic Youth Entrepreneurship & Innovation Competition "ideatree" 2014 implemented by Youth and Lifelong Learning Foundation on Thursday, 26 June 2014. It was the first and most determining Panhellenic distinction, as it changed team's mind and made the software famous in Greece. This was only the beginning for further future developments, which the researchers had not even imagined before. Team's wonderful entrepreneurship journey had just begun. The team had been informed of the competition at a midday of March (2014) by the website of the School of Civil Engineering of the National Technical University of Athens (www.civil.ntua.gr) and decided to take part in it. As far as the first phase (brief written assessment) is concerned, Geomiso achieved a high score with the corresponding comments being very positive, especially those referring to the team's curriculum vitae and the software itself. Thus, the project went through to the second phase (thorough written assessment) and applied again the improved proposal taking into consideration the committee’s notes. Geomiso achieved to go through to the third and final phase, where the 15 finalists “fought” for "the lady", the first award. Not only the final phase (presentation and oral assessment of the 15 finalists), but also the awards ceremony took place in Innovathens - Hub of Innovation and Entrepreneurship Technopolis City of Athens, on Thursday, 26 June 2014. ​The third open-to-the public phase of the competition, during which the 15 finalists presented their projects to a six-member committee and the audience, lasted more than five hours. After the presentations, the committee convened for an hour to define the winners. The committee was consisted of Gregory Yovanof (Professor of Innovation & Entrepreneurship Athens Information Technology AIT), Yiannis Geragotellis (Founding and Managing Partner of KiNNO Consultants LTD), Antonis Livieratos (Consultant, Innovation and Entrepreneurship Unit, NTUA), Nikos Mpakallis (Executive Director at AREMA Energy & Environmental Solutions), Maria Vlachou (Co-founder and Sales Manager at Fereikos-Helix) and Alexandros Fourlis (Managing Director Kariera.gr). ​​Nikos Ververidis (Co-founder of elculture.gr and Aephoria.net) hosted the awards ceremony. The President of Youth and Lifelong Learning Foundation Filippos Lentzas, the CEO OF Youth and Lifelong Learning Foundation Panagiotis Manouris, the Ambassador of the Kingdom of the Netherlands in GreeceJan Versteeg and the Public Relations Officer at European Parliament Antonis Kailis gave a speech. The first winner was the Geomiso team, which was awarded a €5.000 prize and free business incubation for six months (September 2014 - February 2015) in Orange Grove, an initiative of the Embassy of the Kingdom of the Netherlands in Athens. in INNOVATHENS on Thursday, 26 June 2014. The winners of the First Panhellenic Youth Entrepreneurship & Innovation Competition "ideatree" of the Youth and Lifelong Learning Foundation, Geomiso (1st award), Panelsensor (4th award) and mana Greek baby food (5th award), spoke about the benefits of participating in the competition and their further developments. 1. ΙΝΕΔΙΒΙΜ, Ιούνιος 27, 2014. 2. FORTUNEgreece.com, Ιούνιος 27, 2014. 3. ΠΡΩΤΟ ΘΕΜΑ, Ιούλιος 1, 2014. 4. ΙΝΕΔΙΒΙΜ, Ιούλιος 11, 2014. 5. ΕΘΝΟΣ, Ιούλιος 19, 2014. The team applied to the Athens Start-up Business Incubator for the incubation programme in summer 2014 (first phase, written assessment). In November 2014, Geomiso was presented to the Athens Start-up Business Incubator (an initiative undertaken by the Athens Chamber of Commerce & Industry) during the second and final oral phase on the sixth floor of the Athens Chamber of Commerce & Industry, where it was not only evaluated as the best project (with the highest score), but also one of the 42 start-ups (among 149) accepted for the incubation programme in THEA. Geomiso was accepted by the THEA ACCI Scientific Evaluation Committee being the first team that entered the facilities of the Athens Start-up Business Incubator in Kypseli, with the incubation lasting 18 months. Geomiso was awarded an honorary distinction for its successful incubation during the awards ceremony, which took place on the sixth floor of the Athens Chamber of Commerce and Industry (ACCI) on Friday, 11 December 2015. ​​Geomiso was the first team entered the renovated facilities of the Athens Start-up Business Incubator on Tuesday, 4 November 2014. One year later (Friday, 11 November 2015) it successfully fulfilled its incubation programme. at the neoclassical building of THEA on Friday, 19 December 2014. Panagiotis Karakitsios participated in the pitching competition, organized by the Athens Start-up Business Incubator on Friday, 19 December 2014, at the neoclassical building of THEA in Kefallinias 45 street in Athens. Geomiso was evaluated as the best project (among 142) by the scientific committee of the Athens Start-up Business Incubator. Their business mentor Haris Lambropoulos (Assistant Professor of Finance and Human Resources in University of Patras, member of the ACCI Board) transformed this research achievement into a commercial one. Geomiso won second prize in the pitching competition “Entrepreneurship in Athens”, which was organized by the Athens Start-up Business Incubator during the 8th global entrepreneurship week on Sunday, 22 November 2015.
a start-up supported by the Athens Start-up Business Incubator. The closing ceremony of the incubation programme, where Geomiso was conferred an honorary distinction for its successful incubation by the President of the Athens Chamber of Commerce & Industry (ACCI) Constantine Michalos, took place on the sixth floor of ACCI on Friday, 11 December 2015. Geomiso is one of the 12 projects (among 227 candidates) that were approved by the 3rd Angelopoulos CGIU Fellowship 2015, the joint initiative of the Ambassador Gianna Angelopoulos Daskalaki and the Clinton Global Initiative University. This is one of the most significant distinctions for the team as except for the financial support, the software was put on the map and was mentored by the former Associate Dean of Kennedy School of Government in Harvard, Ms. Holly Taylor Sargent. Dimitrios Tsapetis and George Karaiskos departed from the Athens International Airport on Thursday morning, 19 March 2015 to Miami (Florida, USA), in order to participate in the eighth CGIU 2015 annual meeting. During the eighth annual CGIU meeting, students, university representatives, topic experts, and celebrities came together to discuss and develop innovative solutions to pressing global challenges. Students created their own Commitments to Action that addressed issues on campus, in local communities and around the world. Due to the participation in the joint initiative of Angelopoulos CGIU Fellowship, the Geomiso team enriched its knowledge and experience, while introduced the project to the international community. The Greek mission had its own panel. The Angelopoulos CGIU Fellows informed the rest attendees (scientists, entrepreneurs, politicians, celebrities from all over the world) about their Commitments to Action. Geomiso met Bill and Chelsea Clinton. ​With the closing of the eighth annual Clinton Global Initiative University meeting, the President Bill Clinton, Chelsea Clinton and the 12 Angelopoulos CGIU projects offered their voluntary work in a suburb of Miami by taking part in tree planting and renovation of shabby facilities. The support from the joint initiative of the Ambassador Gianna Angelopoulos-Daskalaki and Clinton Global Initiative University is one of the most important distinctions. This support is now being continued with the Angelopoulos Fellowship Continuation Grant 2016 (among 108 projects). It's worth mentioning that Panagiotis Karakitsios began his undergraduate studies at the School of Civil Engineering of National Technical University of Athens in 2004, the year of the “Olympic Games Athens 2004”, when the Ambassador Gianna Angelopoulos-Daskalaki was the chief organizer and one decade later, Geomiso is being supported by Angelopoulos CGIU Fellowship. 1. ΤΟ ΒΗΜΑ, December 16, 2014. 2. kathimerini.gr, December 16, 2014. 3. civil.ntua.gr, March 12, 2015. 4. Ελευθερία, April 19, 2015. 5. ΠΡΩΤΟ ΘΕΜΑ.gr, January 20, 2016. 6. kathimerini.gr, October 31, 2016. In the limits of the 5th “Innovation & Technology” Competition i-bank 2015, Panagiotis Karakitsios spoke about the innovative software. During the 3rd round of the competition (oral assessment), which was held at Megaro Mela (93 Eolou St.) on Tuesday, 28 April 2015 at 12:00, the team presented its software to the committee consisted of Professors, Rectors and executives of the National Bank of Greece. Geomiso won 5th prize among 422 candidate projects. The awards ceremony was held at Megaro Mela on Thursday, 21 May 2015 at 17:00. Costas Fotakis- Research and Innovation Deputy Minister, Louka Katseli- non-executive Chair of the Board in the National Bank of Greece and Leonidas Fragkiadakis- Chief Executive Officer of National Bank of Greece gave a speech at the awards ceremony. 2. Newsit, May 21, 2015. ​3. ΠΡΩΤΟ ΘΕΜΑ.gr, November 9, 2015. 6. ΠΡΩΤΟ ΘΕΜΑ. gr, December 30, 2015. ​​Geomiso was awarded an honorary distinction among 188 participants in the 3rd Applied Research & Innovation Competition “Greece Innovates” 2015, a joint initiative of Eurobank and the Hellenic Federation of Enterprises on Tuesday, 23 February 2016. ​​In the limits of the 3rd “Greece Innovates!”, events and roadshows (exhibition openings) were organised in Thessaloniki and Heraklion Crete so as to multiply promote the 20 shortlisted proposals. Νot only the academic and entrepreneurial community of each city, but also the wider public and media attended these events. ​The first roadshow took place at Noesis-Thessaloniki Science Center & Technology Museum on Wednesday, 27 May 2015, where the team presented the software to both the academic community of Thessaloniki and the local entrepreneurs. Athanasios Leontaris gave an interview on SKAI channel. The second and final roadshow took place at the Foundation for Research and Technology-Hellas on Thursday, 11 June 2015, in the limits of which Panagiotis Karakitsios, Athanasios Leontaris and George Karaiskos spoke about their project to the local academic and entrepreneurship community of Heraklion Crete. in Heraklion Crete on Thursday, 11 June 2015. The oral, open-to-the public assessment (25% of the final grade) of the 3rd Applied Research & Innovation Competition “Greece Innovates” 2015 was held at the Cultural Center of the Foundation of the Hellenic World on Thursday, 25 June 2015. The whole procedure was recorded, while there was the possibility of watching live stream. in the Foundation of the Hellenic World on Thursday, 25 June 2015. The awards ceremony took place at “Antigone Hall” of the Cultural Center of the Hellenic World on Tuesday, 23 February 2016. Geomiso was awarded an honorary distinction, as one of the top ten applied-research projects. The ceremony was attended by members of the Greek entrepreneurial, research and academic community. held at the Cultural Center of the Foundation of the Hellenic World on Tuesday, 23 February 2016. 2. skai.gr, January 14, 2016. 3. Η Καθημερινή, June 23, 2016. Geomiso attended the Advanced School on Isogeometric Analysis, which was held at the University of Vienna and was organised by the ECCOMAS (European Community on Computational Methods in Applied Sciences) in December 9-11 2012, a few days before the 6th European Congress on Computational Methods in Applied Sciences and Engineering. ​Panagiotis Karakitsios and Anastasios Stamatis participated in the 3rd South-East European Conference on Computational Mechanics, where Panagiotis Karakitsios presented a part of research results as far as GPU parallel computing is concerned on Wednesday, 12 June 2013. Geomiso in the 3rd South-East European Conference on Computational Mechanics. The winners of the First Panhellenic Youth Innovation and Entrepreneurship Competition “ideatree” spoke about their innovation in the limits of the event “Disrupt, Startup, ScaleUP”, which was organised during the Global Entrepreneurship Week at Megaron Conference Hall in November 2014. Panagiotis Karakitsios underlined the opportunities that Greece is offering and what will take to succeed in the toughest places. Interview of the “ideatree” competition winners. 1. iefimerida.gr, Νοέμβριος 12, 2014. 2. inedivim.gr, Νοέμβριος 18, 2014. The Geomiso team took part in Researchers’ Night, which was organised by the National Technical University of Athens at the Averof Building on Friday, 26 September 2014 and was sponsored by the European programme Horizon 2010 “2014-2015 Researchers’ night: The Greek events”. Eleni Michael and Dimitios Karras presented their research activity to students, educators, researchers and professors. 1. politexnikanea.gr, September 11, 2014. 2. επιχειρώ, September 16, 2014. 3. kathimerini.gr, September 18, 2014. 4. enimerosi24.gr, September 24, 2014. 5. tanea.gr, September 25, 2014. During the visit of Development & Competitiveness Minister in Orange Grove Nikos Dendias, the team informed him of its software, its progress and how Greece contributed to their evolution. 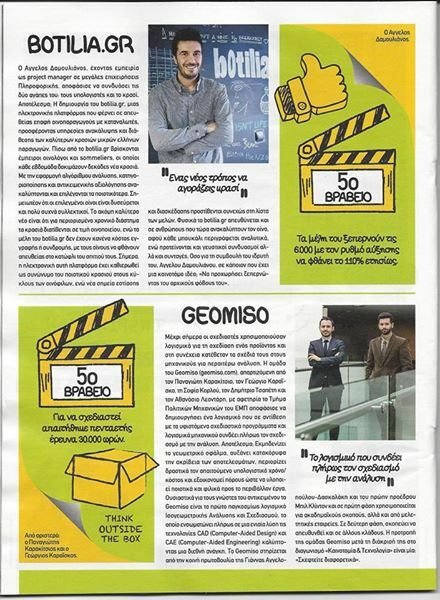 The Geomiso team was interviewed by the Hellenic Broadcasting Corporation. Panagiotis Karakitsios spoke about the team’s progress in Greece of crisis. 1. webtv.antenna.gr, October 21, 2014. 2. startupper.gr, October 22, 2014. Geomiso participated in the Pioneers Festival, one of the top European conferences for future technologies and entrepreneurship, the weekend of May 28-29 2015. More than 1.600 start-ups from 90 countries submitted in order to meet more than 400 investors in Hofburg Imperial Palace in Vienna (Austria). Geomiso was the only one team (among 7 teams of the Greek mission in Austria) chosen by the Athens Start-up Business Incubator to take part in the pitching competition. Panagiotis Karakitsios presented the Geomiso software to international investors, while he set the base for future collaboration with European and American start-ups. The support of the Head of the Commercial Section in Vienna Aggeliki Sarri was crucial to this direction. The registration fee was paid by the Athens Start-up Business Incubator. 1. Food Business, October 22, 2015. 2. ΕΒΕΑ, October 23, 2015. Geomiso took part in the event “RESEARCH-INNOVATION-ENTREPRENEURSHIP Do not leave your research on the shelf”, which was organised in order to celebrate the 4 years of the operation of the Innovation and Entrepreneurship Unit of the National and Technical University of Athens at the Network Management Center of NTUA, on Thursday, 22 October 2015.
at the Network Management Center of NTUA on Thursday, 22 October 2015. The Rector of NTUA Ioannis Gkolias, the Professor Ioannis Kalogirou, the Professor and Director of the Laboratory of Hemodynamics and Cardiovascular Technology (LHTC) of the Technical School of Lausanne (EPFL) Nikos Stergiopoulos and the Manager at So Kwadraat Johan Van den Bossche were the main speakers. Panagiotis Karakitsios spoke about the Geomiso software and its development. 1. ntua.gr, September 25, 2015. Eleni Michael and George Karaiskos joined Slush 2015 in Helsinki Finland, where they not only presented the Geomiso software (in a special demo booth) to investors and startups from all over the world, but they also exchanged ideas and set the base for new collaborations. They were also interviewed by the Finnish media. The Athens Start-up Business Incubator paid the registration fee for the entrance to Slush, while Angelopoulos CGIU Fellowship paid the rest cost of Geomiso mission in Finland. 1. HSfi. Helsingin Sanomat, November 12, 2015. Athens Chamber of Commerce & Industry (Hermes Hall) on Monday, 16 November 2015. After an official invitation, Panagiotis Karakitsios presented the Geomiso software at the plenary session of Athens Chamber of Commerce & Industry (6th floor, “Hermes” Hall) on Monday, 16 November at 19:00. The presentation was attended by known businessmen including the President of the Athens Chamber of Commerce & Industry Constantine Michalos, the First Vice President John Syngelidis and the Second Vice president Paul Thomoglou. Geomiso was not only approved by the Athens Chamber of Commerce & Industry, but also by the Greek-German Chamber of Commerce & Industry to attend the Greek-German Business Forum “Restoring Confidence and Navigating for New Trade, Investment and Startups”, which was held in Berlin on Tuesday, 5 April 2016. George Karaiskos and Christos Gkritzalis fulfilled the b2b meetings with German companies and the Geomiso presentation to German investors successfully. The total cost of Geomiso mission in Germany was paid once again by Angelopoulos CGIU Fellowship. 1. Έθνος, April 19, 2016. 2. naftemporiki.gr, April 19, 2016. 3. euro2day.gr, April 19, 2016. Geomiso participated in the Athens Science Festival 2016. Many scientists attended the Geomiso workshop, which took place in Innovathens, on Thursday, 7 April 2016. George Karaiskos and Christos Gkritzalis presented the software to the crowded facility room. The team also organized an interactive incident on Sunday, 10 April 2016 by using marshmallows and spaghetti, symbolizing control points and finite elements respectively, in order to get the new generation of engineers familiar with the Geomiso mindset. 1. iefimerida.gr, April 6, 2016. 2. newpost.gr, April 6, 2016. 3. Athens Science Festival, April 7, 2016. Panagiotis Karakitsios and George Karaiskos attended the event for the Annual General Assembly of the Hellenic Federation of Enterprises, which was held at the Athens Concert Hall on Tuesday, 21 June 2016 at 18:00. Many distinguished personalities gave a speech, among them: the President of the European Commission Jean-Claude Juncker, the President of Greece Prokopis Pavlopoulos and the Prime Minister of Greece Alexis Tsipras. On the ground floor, there were panels with photos and description of the 20 shortlisted participants and their groundbreaking projects of the Third Applied Research & Innovation Panhellenic Competition, which is jointly supported by Eurobank and Hellenic Federation of Enterprises. Among them was also the Geomiso project. So, all the attendees had the opportunity to be informed of the first worldwide fully integrated CAD/ CAE software. 1. ΣΕΒ, June 8, 2016. Event for the promotion of Youth Entrepreneurship at the Cultural Center of Kifissia on Monday, 4 July 2016. Geomiso was one of the two start-ups, which were officially invited by Kifissia Municipality to present their work at the event for the promotion of Youth Entrepreneurship, which took place on Monday, 4 July 2016 at 20:00 at the Cultural Center of Kifissia and was a joint initiative of Athens Chamber of Commerce & Industry and Kifissia Municipality. 1. ΒΟΡΕΙΝΗ, July 5, 2016. 2. Ζούγκλ@, July 6, 2016. ​The Geomiso team took part in the European Researchers’ Night 2016, which was organised by the National Technical University of Athens at the Averof Building on Friday, 30 September 2016. Christos Gkritzalis and George Karaiskos presented their research activity and some applications of Geomiso software to students, educators, researchers and professors. 2. civil.ntua.gr, October 2, 2016. Panagiotis Karakitsios and his business mentor Haris Lambropoulos on the TV programme of Fanis Papathanasiou and Marion Mihelidaki on the Hellenic Broadcasting Corporation, on Friday, 16 October 2015 (11:45-12:00). on Saturday, 13 June 2015 (13:25-13:35). The Athens Mayor, Giorgos Kaminis invited Panagiotis Karakitsios to his monthly broadcast programme “Appointment with the Mayor” on Athens 9.84 on Friday, 26 June 2015. Panagiotis Karakitsios was interviewed about Geomiso, the youth entrepreneurship and the opportunities that Greece of crisis is offering on Proinos FM 105.3 by Eleni Nizami, on Tuesday, 5 January 2016. Panagiotis Karakitsios live on the Hellenic Brioadcasting Corporation 101.2 (Thessaly Net), on Thursday, 7 January 2016 (12:45-13:00). Panagiotis Karakitsios and George Karaiskos were invited to the TV programme of SKAI “Proti grammi” of Vasilis Lyritzis and Dimitris Oikonomou, where they talked about the international innovation of the Geomiso software and how the 3rd Applied Research & Innovation Competition “Greece Innovates” contributed to their effort on Wednesday, 13 January 2016.